A physics-based documentary may sound yawn-inducing, but this trailer for Particle Fever, about the Large Hadron Collider, looks like a surprisingly good time. Seriously, this could be really interesting. I can barely multiply and I’ll go see this when it arrives at a theater near me. In a town like Boston, I won’t be the only geek munching on popcorn while watching a science flick. For those of you who don’t know what the Large Hadron Collider (LHC) is, let me try to explain. Or you could just wait to see Particle Fever, as I’m sure it provides a much better explanation. What the hell, here goes nothing. 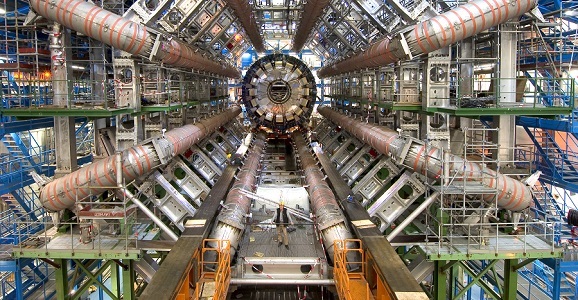 The LHC is the biggest, baddest machine ever built. Its construction at CERN (the European Organization for Nuclear Research) in Geneva, Switzerland took an entire decade, from 1998-2008, and it lives in a tunnel 574 feet underground that has a circumference of 17 miles. Dark matter is the cosmic holy grail. The elusive stuff is hypothesized to make up about 27% of the Universe (dark energy, which is something slightly different, makes up about 68%), but its existence has never been conclusively proven, largely because no one has ever actually seen the stuff. 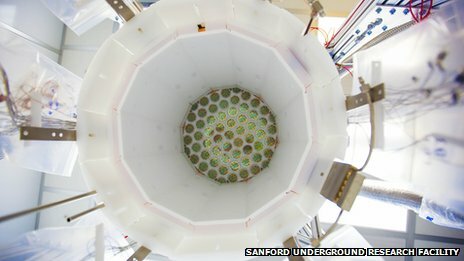 Scientists were hoping to change that with the Large Underground Xenon, LUX, which is the most sensitive, high-tech dark matter detector in existence. LUX completed its first run of experiments on Wednesday, but turned up nothing. Before we get further into the LUX’s missoin, I want to address something I keep reading—that dark matter comprises the majority of matter in the Universe. This is where the confusion between dark energy and dark matter comes into play, and while they’re closely related, it’s not technically correct to conflate the two terms. Or at least, that’s what astrophysicists currently believe. Dark energy is a force that accounts, at least in part, for the accelerating expansion of the universe. Dark matter, on the other hand, isn’t a force—it’s, well, matter. We think it’s there and we think we’ve seen it, such as in the photo below of the Pandora’s Cluster. The areas noted by the blue and red circles indicate a separation between hot gas and dark matter. While colliding particles in gas clouds generate electrical energy that causes friction and slows them down, the dark matter remains unaffected by friction or other effects of the hot gas, leading to the separation between the two. There’s no denying that Google Street View is one of the most interesting and downright amazing bits of technology that currently exists. I’m never going to set one half-frozen foot down in Antarctica, but Google has allowed me to spend time there anyway. Their latest trip takes couch-bound explorers into the seemingly mundane headquarters for arguably the most complicated and potentially game-changing piece of machinery on Earth: the Large Hadron Collider. In fact, the Google team took two weeks to tour the world’s largest particle physics center, the CERN (European Organization for Nuclear Research) facilities near Geneva, Switzerland. They rode the “Street View Trike,” which was specially equipped with 360-degree cameras, around the experiments ATLAS, ALICE, LHCb, and CMS, according to CERN’s Dan Noyes. “We’re delighted that CERN opened its doors to Google Maps Street View allowing anyone, anywhere in the world to take a peek into its laboratories, control centers and its myriad underground tunnels housing cutting-edge experiments,” said Google’s Pascale Milite. This Wednesday a new Nova miniseries premiers, and that means more sciency learning from smart guys who really know how to lay things out for us common folk. As much as I love to read science journals, and pour over scientific findings, I’m far from capable of understanding all of the intricate details found therein. That’s where you need a guy like Brian Greene, who with his Ira Glass like tone is able to explain even the most insanely complex physics concepts in an easy to digest manner. In the below video from the episode “What is Space?” of Nova: The Fabric of the Cosmos, the Higgs Boson particle is addressed. The role of the Large Hadron Collider in searching for the particle is discussed, but even more interesting is Professor Higgs discussing the 1964 presentation where he flipped the common view of the universe on its ear with the suggestion of the Higgs-Boson particle.